about two and a half years ago I embarked on a commitment to stop wearing aluminum-based deodorant. while it’s a highly debated topic (and I am not trying to tell anyone what to do, nor do i claim to be a medical/scientific expert), there is plenty of credible research suggesting a link between aluminum-based compounds and an elevated risk factor for the development of breast cancer. given that several amazing women in my family have all been subject to this terrible disease, i decided it was better to be proactive and eliminate these products as soon as possible. now that i get older, it’s becoming more and more obvious I should watch the chemicals in my beauty regimen more closely, given how much time and effort i spend knowing the ingredients in my food and trying to eat organically. however, the road towards all natural beauty products can be a rocky one, especially for a product that plays as critical a role to everyday hygiene as deodorant. Until recently, it was hard to find any sort of substitute that was effective. thankfully the growing buzz around natural beauty has driven the creation of several new brands, with new products coming out almost weekly. I first struck out with Tom’s for men at Whole Foods, the only aluminum free option I could find, but today there are so many more choices! (for comparison, there was one natural option available at sephora just a year ago and now there are 20+). Despite the expanded selection, you still have to be careful since some are great while others have been flat out useless. 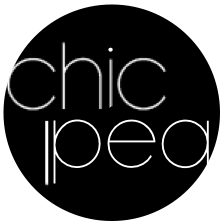 For this reason, I decided to review ten types I’ve guinea pigged over the years, for those of you who are new to the idea of going all natural, or for anyone not loving their current deodorant. trust me, it took a lot of trial and error and I am still tweaking, with no five star option to be found (also full disclaimer, occasionally i cheat with Secret before a big event or meeting because stress sweat is. not. cute.) also since this process is an extremely personal one and what works for one person might not for another, there is also a very extensive review by the nyt here with additional options. If you’ve tried any of these, feel free to leave your ratings in the comments below! and a plea to my dear readers– if there are any good ones i’ve missed, pass along your recommendations! please and thank youuuu. the everyday all star (4 stars)- while putting my top pick at the beginning of the list may prevent you from scrolling further, this schmidt’s natural ($8.99) is my current favorite and it comes in enough scents to appease even the pickiest of noses. versus some of the others, it does feel gritty gliding on, but i’ve never noticed this during the day. and most importantly, compared to others, it really works. the necessary evil (3 stars)- while i do not love this one as an everyday option, hence why it only gets three stars (goes on a little too slick feeling so you never feel completely dry), the takesumi detox ($22) is a great option for beginners to jumpstart the process, because the active charcoal pulls old toxins out. the friend favorite (3 1/2 stars)- one of my dear friends and lovely yogi teacher JJ recommended primal pit paste ($10.95) to me at a bachelorette last year. if it weren’t for my recent discovery of schmidt’s i would have reordered this bad boy because it worked well enough. but the other reason it got dinged? as you can sort of see in the photo, the twist up container arrives only 1/2 full, so i found myself burning through it quickly and needing another (this was the only natural deodorant i’ve ever actually managed to get to the bottom of). the old faithful (2 1/2 stars)- while at one point in time i would have given Tom’s of maine ($5.79) 3 stars because in a pinch it will do, the arrival of better products means this one has fallen by the wayside. 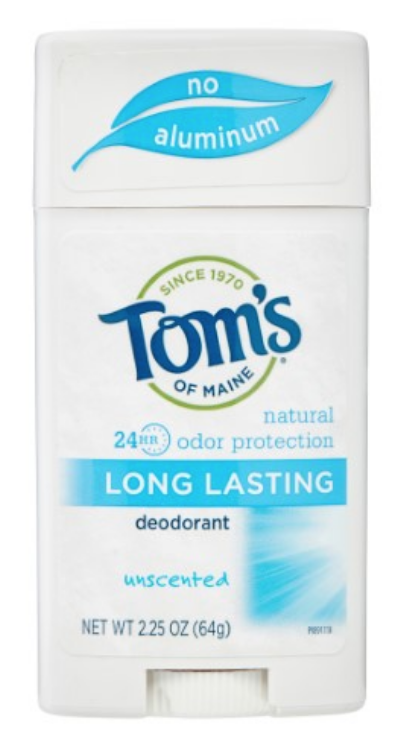 i’ve been really disappointed with Tom’s ever since Colgate purchased them; the lack of innovation sort of demonstrates how Colgate is using it as a cash cow rather than really trying to improve their product offerings. bonus points to this one for coming in a rare ‘unscented’ option though. 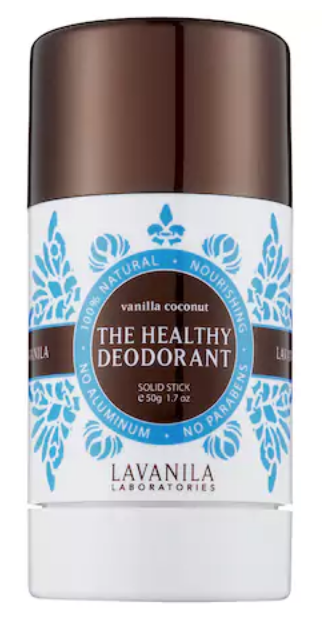 the designer deodorant (3 stars)- while Sephora has many other more expensive (Tarte, Milk, etc.) upscale branded deodorants, other than the Taksumi detox, I haven’t really toyed around with a $20-30 option. however, lavanila ($14) is a new product with cute packaging and a plethora of sweet scents. i still think other options might work better, but given the cute packaging and value size it definitely deserves a solid score. the base spray (2 stars)– while i do not think this eo deodorant spray ($6.99) is effective on its own, which is one reason why i gave it a low score, JJ also recommended this as a “primer” of sorts before putting on the primal pit paste or another natural stick deodorant. it’s sort of annoying to have to use two different deodorants, especially if you can’t get them to have matching scents (the OCD in me required using the lavender smell in both since it was the only one I was sure would coordinate, but i hate the smell of lavender), and i found that you have to wait 1-2 minutes of dry time in between applying. overall, while it probably did help a little, i found it to be too much work and sort of gave up. that said, i do keep it in my gym bag now for a quick pick me up if i have errands to run or grab dinner directly after i work out. 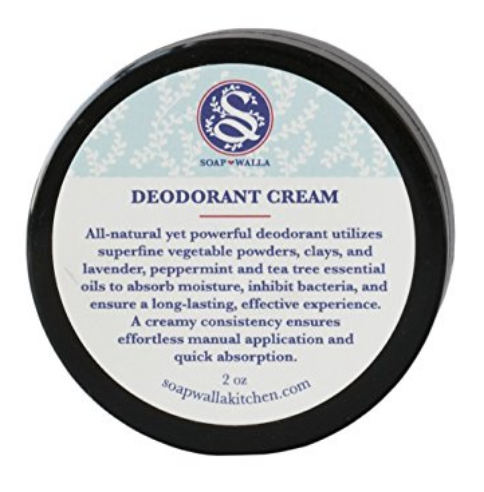 the new kids to try (rating pending)– i have heard rave reviews about both native deodorant ($12) and soapwalla deodorant cream ($19) so these are my next two purchases and i will report back!